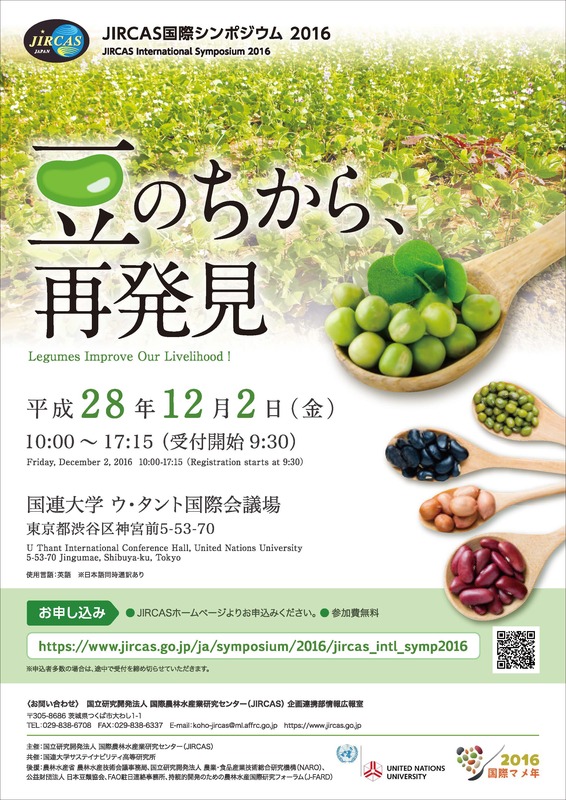 JIRCAS International Symposium 2016 "Legumes improve our livelihood!" On the auspicious occasion for the celebration of the International Year of Pulses 2016, JIRCAS organizes an International Symposium entitled “Legumes improve our livelihood? -beyond the IYP2016”, on 2 December, 2016 in Tokyo. The importance and significance of leguminous crops in the world agriculture, food, and nutrient security is widely recognized. They are highly nutritious, economically accessible and contribute to food security and human health. They are cultivated in all over the world in various cropping systems and sustain biodiversity of the systems. They promote sustainability of agricultural lands with their ability of air nitrogen fixation. Agricultural products made from legumes have been effectively involved in international and local economies and bring benefits to various sectors through the chains of value addition. In this symposium, we shall revisit to these superior natures of leguminous crops in different perspectives, through keynote lectures by renowned speakers and the following three sessions with specialized presenters. Finally, general discussions will be made by selected panelists as well as audience about the future and way forward toward the further utilization of legumes and pulses for the world development, in lines of aiming at the United Nation’s 17 Sustainable Development Goals (SDGs) particularly the second goal (i.e., “End hunger, achieve food security and improved nutrition and promote sustainable agriculture”).